Since I last updated, I’ve moved back across the country to my homeland in the West. Oh, Pleasanton, please take me back. I’m sorry I ever left you. It was very sad to leave White River Junction back in August, but I know it’s not good-bye, because there is no good-bye, Juncy White River. I learned that little gem from this man, and now I pass it onto you my friends. 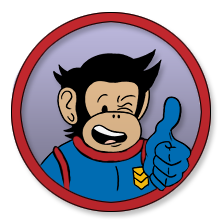 I’m currently working on freelance design, coloring Chimps in Space, drawing the next Solstice Submarine issue and finishing up a graphic novel project I started back in May with a group of awesome people from CCS that I can’t really talk about ’til we’re done. You know how that is. Anyway, if you haven’t checked out Chimps in Space in color, you need to go to chimps-in-space.com which I’m updating every week with a new page from this thrilling saga. Volume 1 is almost completely posted (there’s one more week to go!) and then I’m going to start posting Volume 2. I’ve also recently put up a new site online to showcase my graphic and web design portfolio. Have a look here, and tell me what you think. I’m also currently open to new clients so if you are severely lacking in a beautiful website or a new logo to your awesome business (or have friends and family who do) contact me and spread the word. The Blog Blays are Over! (Can you tell that I can’t stop listening to Florence + The Machine)?